Make a statement while you stretch your ears with our brand new UV ear expanders. We have a great new range of spiral ear expanders that glow in UV light and look awesome even after you finish stretching your ears. UV jewellery is bright, comfortable to stretch with and great value as well. These ear expanders start at just £1.95, so you can treat yourself to as many colours as you like. Here you can see some of our brand new spiral ear expanders, which come in seven super-bright UV colours. 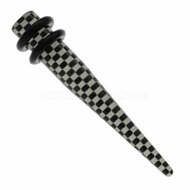 These expanders are a great option for stretching your ears. The spiral shape is easy to handle and gives you real precision when stretching. It is also more comfortable to wear than a straight taper – especially at night. The UV acrylic material is very light and durable, so you can barely feel them in your stretchings. This means less stress on the piercing and less pain while you get to your desired gauge. We also have a great range of patterned straight ear expanders. These tapers are easy to use and a classic way to stretch your ears. The eye-catching patterns make it easy to match your tapers to your style, whether you prefer classic skate checkerboard, bright colours or girly pink. This entry was posted in Stretching Jewellery, UV Body Jewellery and tagged ear expander, ear expanders, Stretching Taper Pins, Stretching Tapers, UV Body Jewellery, UV Jewellery on May 23, 2012 by Piercing Guru. 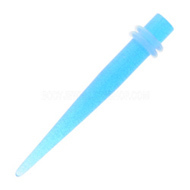 Acrylic ear stretchers are a cheap, comfortable and easy way to stretch your ears. Acrylic is a high quality plastic that is very light, durable and affordable. I have found acrylic ear stretchers to be very comfortable to use and you can even wear them as jewellery after you have stretched your ears. 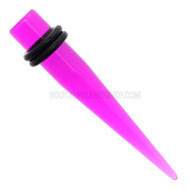 The main advantage of acrylic ear stretchers is how lightweight they are. 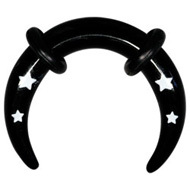 Heavy stretchers can pull on your piercings but with acrylic, you’ll hardly feel them at all. This puts less stress on the piercing and gives it a better chance of healing quickly. It also makes them comfortable to wear while your ear is healing – even at night. 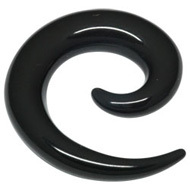 There are 3 main shapes of ear stretchers: spiral, crescent and straight. They are all used in the same way but some people find different shapes more comfortable. You can also choose the one you think looks best. 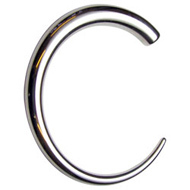 At Body Jewellery Shop we have a great choice of acrylic ear stretchers in different colours, sizes and shapes. This entry was posted in Ear Piercings, How To Stretch Piercings, Stretched Piercings and tagged 00ga Stretching, Ear Stretcher, Ear Stretchers, Ear Stretching, Ear Stretching Jewellery, Stretching, Stretching Jewellery, Stretching Piercings, Stretching Pin, Stretching Taper Pins, Stretching Tapers on January 14, 2011 by Piercing Guru. 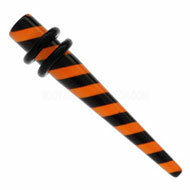 If you want to make a statement while you stretching your ears, take a look at out range of UV stretching tapers. UV tapers glow brightly under UV light or black light, so they are a great option for clubbers or any one who loves bright colours. 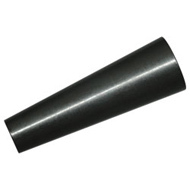 Most UV stretching tapers are made from UV-reactive acrylic. Not all acrylic is UV reactive, so it is worth checking before you purchase your tapers. UV-reactive acrylic is a lightweight, cheap and comfortable material for stretching. Most people find it very comfortable and some even continue wearing their tapers after they are done stretching. This entry was posted in Ear Piercings, How To Stretch Piercings, Stretched Piercings, Stretching Jewellery, UV Body Jewellery and tagged 00ga Stretching, Ear Stretching, Ear Stretching Jewellery, Stretching Jewellery, Stretching Piercings, Stretching Taper Pins, Stretching Tapers, uv, UV Body Jewellery, UV Body Piercing, UV Jewellery on November 22, 2010 by Piercing Guru. 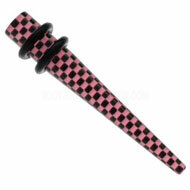 If you want to stretch your piercings cheaply and quickly, acrylic stretching tapers are a great option. PMMA acrylic is a very light, durable and affordable material and it is great for body jewellery. These acrylic stretching tapers are easy to use and they come in a huge range of colours, so you can have a cool look while you are sizing up. Acrylic is comfortable to wear and it is non-irritating, so it should not irritate your piercing or cause any kind of allergic reaction. Another great thing about acrylic stretching tapers is that they have a nice smooth surface. This means that you can slide them smoothly into the piercing gradually. 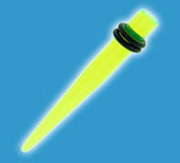 If you like to make a statement with colour, youâ€™ll love these neon acrylic stretching tapers. 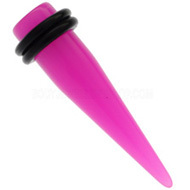 These stretching tapers are really bright and they come in pink, orange, blue, yellow, purple and green. These stretching tapers have a nice chunky shape and they are not too long. They also have a rounded tip, so they are comfy to wear and wonâ€™t poke your skin. I love these tapers because they are just so cute and the colours really jump out at you. This entry was posted in Acrylic Body Jewellery, Ear Piercings, Stretched Piercings, Stretching Jewellery and tagged Acrylic Jewellery, Acrylic Piercing, acrylic piericng jewellery, Piercing Taper, Piercing Tapers, Stretching Taper Pins, Stretching Tapers, Tapers on November 16, 2010 by Piercing Guru. 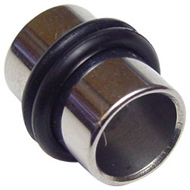 Taper pins come in a gigantic range of styles, colours, materials, sizes and designs. Designed to be used in stretched piercings, different types of taper pins can be used to stretch your piercings up before fitting your jewellery, or, you can even leave the taper pin in your stretched piercing as jewellery! 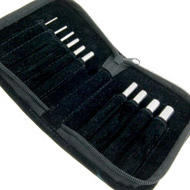 This handy taper pin kit is designed to stretch piercings from 1.6mm to 10mm, perfect as a gift or handy set for personal use and to keep your stretching taper pins organised, clean and neatly stored. The taper pins in this kit have a hollow end to align with your piece of jewellery, making the stretching process easy and hassle-free. The taper pin kit has 10 tapers in total, made of surgical steel. There are more surgical steel taper pins in our surgical steelÂ stretching gear section. 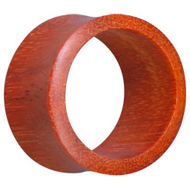 Wooden taper pins are only recommended for fully healed stretches, as wood is aÂ porous material. Porous materials areÂ not suitable for healing piercings or stretches, as they will absorb fluids and can harbour bacteria. 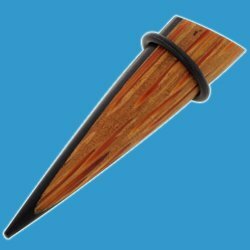 Wooden taper pins can be worn as jewellery and look fantastic, with natural grain and colour, the stunning finish creates aÂ very natural, traditional, tribal look and feel. These new hologram taper pins are bright and reflective, with a really shimmery hologram inserted into the stem of the taper. Available in a choice of colours, the hologram tapers are really funky and bright! Hologram taper pins are part of our fabulous UV taper range, with many different patterns and designs that glow under ultra violet light! This entry was posted in Stretched Piercings, Stretching Jewellery and tagged Pins, Stretching Pin, Stretching Taper Pins, Taper Pin, Taper Pins, Tapers on November 13, 2009 by Piercing Guru.